My biggest thrill is in coaching, supporting, and teaching others how to recapture their lives and make their dreams come true. Back in B.E. (Before Evan) I taught college English and EFL, and wrote and developed a curriculum for an online language school. I met Evan after earning my masters degree from CSUN and moving to the Rockies. Together we operated a cleaning business and set out to teach others how to blaze their own paths and become self-employed. Evan excels at business systems-design, problem solving techniques, web programming and online marketing. He has been a entrepreneur since 1996. He owned and operated a commercial and residential cleaning business for 10 years. Meantime, he and I launched start-cleaning-business.com in 2004. We continued cleaning homes and offices until start-cleaning-business.com developed into a full-time business. Ev and I are committed to teaching you the skills to start and operate a successful, independent, cleaning-service business. Our business system is a positive blend of 3 ingredients: My professional training as a teacher/coach and writer, Ev's technical and systems-design expertise, and our combined entrepreneurial experience in running a professional cleaning service. The start-cleaning-business.com idea was born in the Fall of 2003. We began working on the website and our initial business-method book. Start-cleaning-business.com was launched in April. Almost immediately we began selling our first book, titled How to Start a House Cleaning Business. 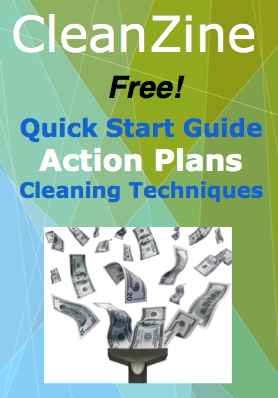 It is one of the top selling house-cleaning business ebooks online. We released the How to Start an Office Cleaning Business book. It was a natural progression and an instant success. We released the How to Start a Window Cleaning Business book. We also retired from professional cleaning to devote all of our time to cleaning business consulting. We launched the Pro Membership Service (for house, office and window cleaning). In addition, we began offering professional cleaning business website design services. The website design service is now included in the Clean Up Now System. We added the How to Start a Carpet Cleaning Business book to our line of books and the carpet cleaning business Pro Membership service, the updated version is currently included in the Clean Up Now System. 2010 saw the introduction to the Bundle Discount, allowing access to all 4 cleaning business methods, the Pro Membership Service and the business website design service. All of these services are now updated and included in the Clean Up Now System. We introduced the Start Up Now System featuring elite, custom resources for starting a cleaning business! Now included in the Clean Up Now System. The Grow Club had its debut. A customized service for existing cleaning services designed to increase profits while de-stressing work life. Now included with the Clean Up Now System. The Cleaning Up Club was released. This unique service was a culmination of 10 years of research and development. It was a top selling cleaning business system of 2015! The Clean Up Now System is released. A cutting-edge turn-key business system that offers one-on-one mentoring along with high-tech tools and step-by-step action plans. Clean Up Now System V2.0 is released. The Clean Up Now System continues to evolve monthly.